Odell Beckham Jr. officially said goodbye to New York. “So many mixed emotions and feelings,” Beckham wrote on Instagram on Thursday morning. “This is all, a lot to process but it is reality. I don’t kno (sic) exactly what to say so just gotta keep it real and short. I want to thank the NY Giants organization for giving me an opportunity to do what God put me on this earth to do, I want to thank the organization and the owners for everything and especially giving me my first chance to be a part of the NFL. The Giants announced the trade of the superstar receiver to the Cleveland Browns on Wednesday after five seasons. Big Blue handed OBJ a five-year, $90 million contract extension less than seven months ago. Beckham compiled 5,476 yards on 390 receptions with 44 receiving touchdowns in 59 games with the Giants. 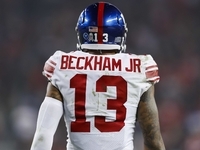 The relationship between Beckham and the team wasn’t always easy, with the organization tiring of perceived antics of the receiver, which took the spotlight off his sterling on-field play. Even after the trade, OBJ will remain a polarizing character in New York for years to come.